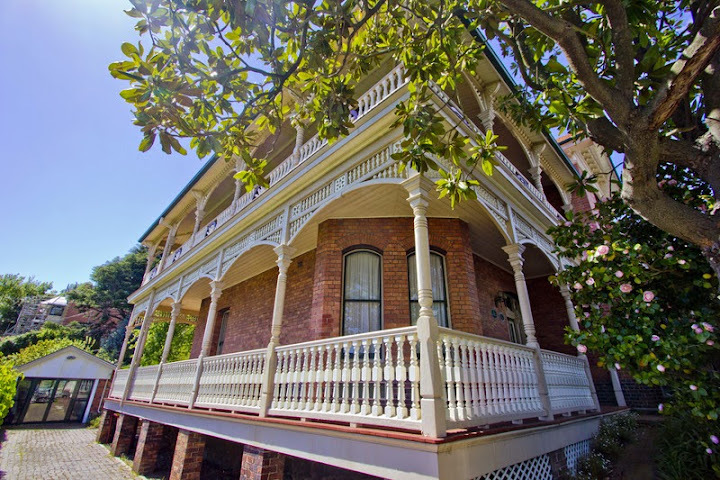 An excellent example of a Federation style house with many fascinating details including decorated barges and gable ends, highly decorative timber verandah with fine turned columns and balusters (spindles), frieze and bracing, projecting bay windows and extraordinary timber fence. The building is complemented by a good garden and is an essential townscape element. fine two storey brick Federation style house. It has terracotta tiled roof, decorated barge boards and wooden gable ends and finials. 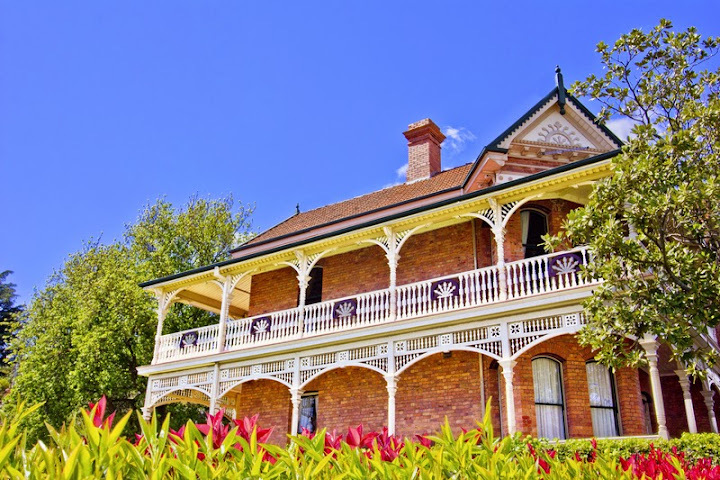 The eaves are bracketed and there is a two-level verandah with elaborate turned posts, balustrades and valences on three sides of the house. It has a projecting corner bay window (with its own gable end) at both levels. The windows have flat-arched tops and brick lintels. One has a stuccoed balustrade over a ground floor bay window. 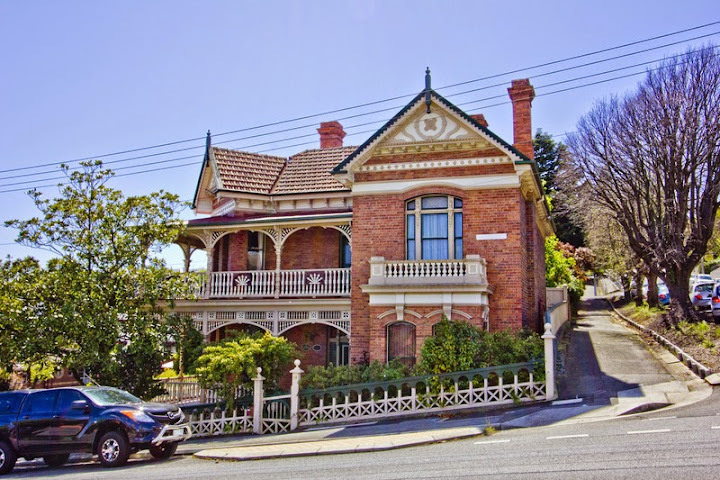 Built around 1900, this Queen Anne Federation home has been extensively restored to it’s original features, overlooking the Tamar River and Launceston. 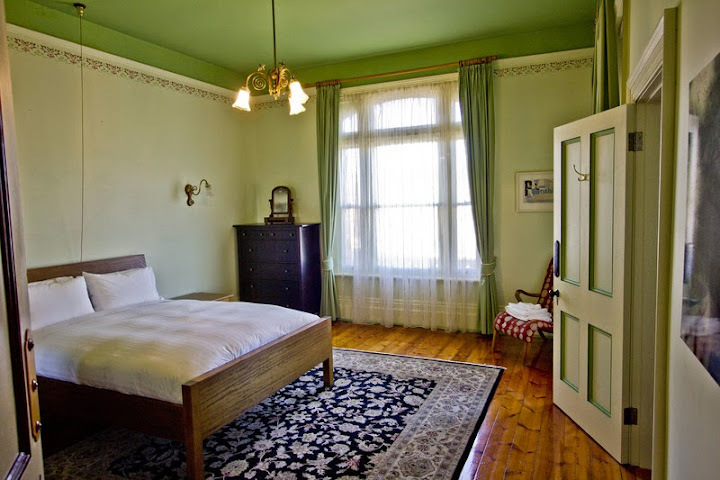 Hargate, circa 1900, is an authentic Tasmanian heritage experience, yet one that offers every luxury and amenity of a contemporary age to ensure the most memorable and comfortable of stays while you holiday and relax in Tasmania. “Sometimes, a house isn’t just about bricks and mortar. Hargate was designed and built as a grand townhome by Mr Joseph Humphreys in 1900, for his wife Annie and their five children. Joseph was the architect, building foreman and silent partner of Tasmanias’ most renowned builders of the time, J & T Gunn. Upon his retirement Joseph became a Launceston City Councillor. Subsequent generations of the Humphreys’ family still live in Launceston today. Hargate was sold by the Humphreys’ family in 1924, and between 1925 and 1937, became a small hospital, and thereafter, a tenancy house for several years. During this period of varied ownership and use, Hargate was considerably damaged internally and was poorly maintained externally causing it to fall into disrepair. In 1942 Hargate came back into private ownership. Successive well known private owners since that time have each contributed significantly to Hargates’ revitalisation with the most recent rennovations by the current owners recapturing the original plans of the grand town home Joseph Humphreys had designed for his own family. Due to its’ architectural significance within Launcestons’ built environment, Hargate was listed with the National Trust of Australia and the Tasmanian Heritage Council in 1979. Hargate had the first Marseilles terracotta tiled roof in Launceston, (so named because the tiles were imported from Marseilles in France) and features a unique Italianate balustrade, rare individually gabled projecting corner bay windows, unique highly decorative and detailed verandahs with fine turned columns and bracketed eaves and an extraordinary and original cross check front fence and gates. 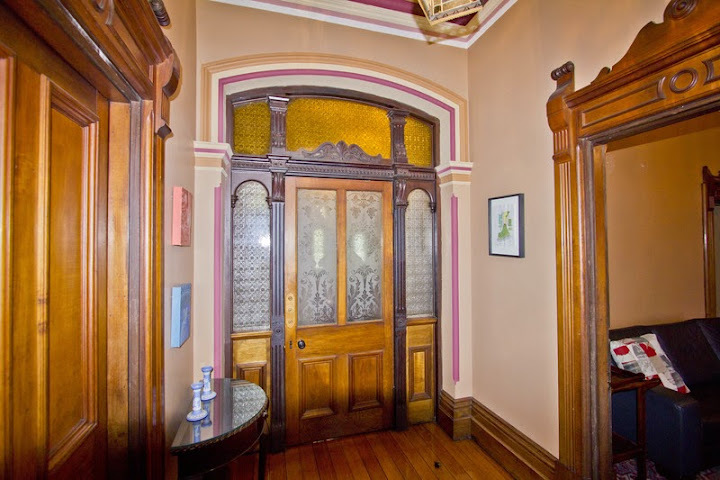 Importantly both the ornate verandahs and fence are made of the now rare and highly coveted celery top and huon pine, both endemic to Tasmania and arguably the most water resistant timbers in the world. By good fortune Hargate retains every title deed of its’ successive owners since its’ original land holding was allocated in 1840. Luxury GuesthouseHargates’ unique heritage has been painstakingly researched by its’ owners and significant written and photographic records from that research are now displayed within the house for the benefit of guests, capturing not only the history of Hargate, but also its’ role in the history of Launceston. 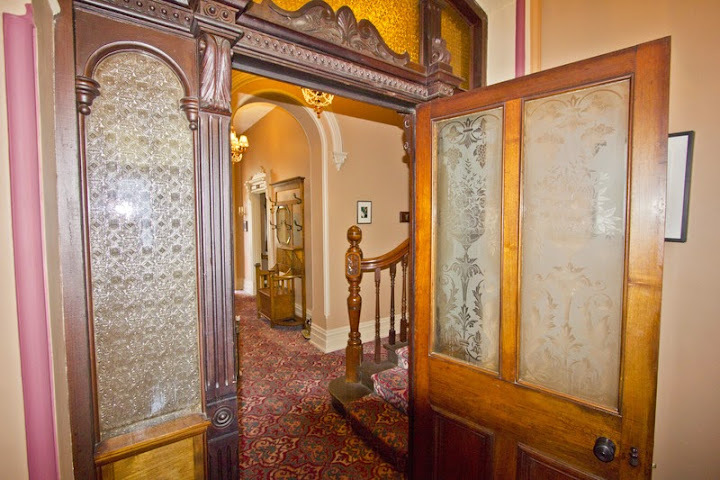 Now as luxury heritage accommodation, Hargates’ past can be cherished and its’ future assured. For the discerning traveller, Hargate will provide outstanding amenity and a rare opportunity to experience the unique qualities of Tasmanias’ built heritage, gentle lifestyle and intriguing history. Hargate, circa 1900, ticks every box, but also a few more you might not have considered. This outstanding Queen Anne Federation has stood as a grand sentinel watching over the sweeping vista of the valley and a river at one time lined masted ships. Hargate has measured the progress of time in a city where heritage is a much loved as its gentle lifestyle and beautiful scenery. 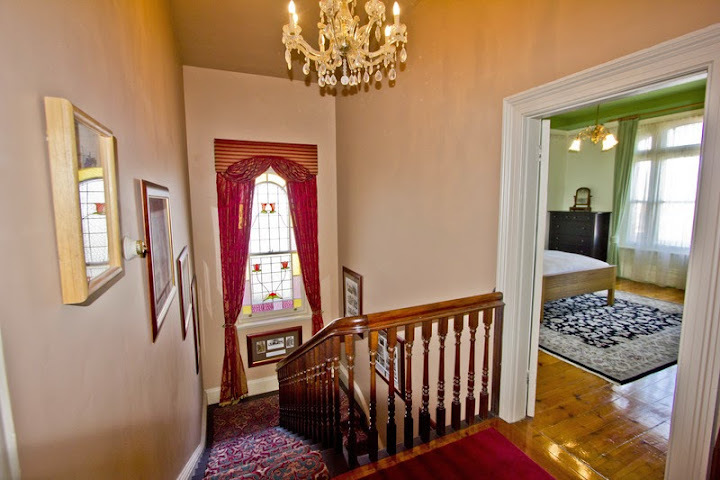 Hargate is an iconic and beautifully restored heritage listed Launceston city mansion providing 300 degree views to the horizon over Launceston and the Tamar River. Built between 1900 and 1903 in the gracious Queen Anne Federation style. Hargate displays unique and impressive architectural features and enjoys a delightful and significant history. 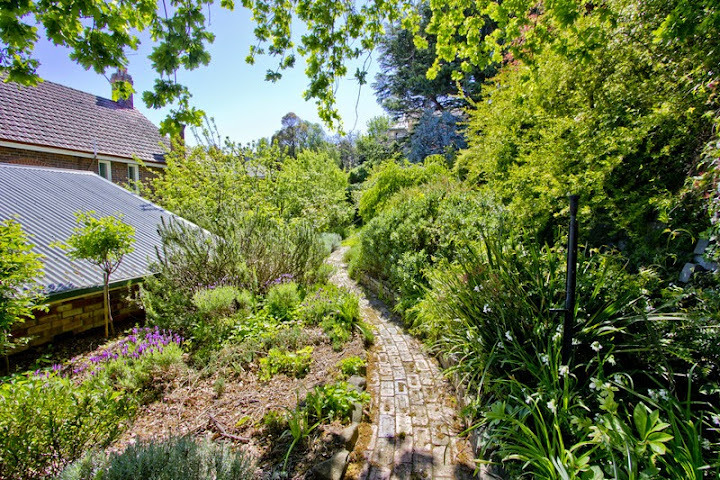 Hargate is set within a large and authentic heritage style landscaped garden. Seven upstairs rooms comprised of four bedrooms. 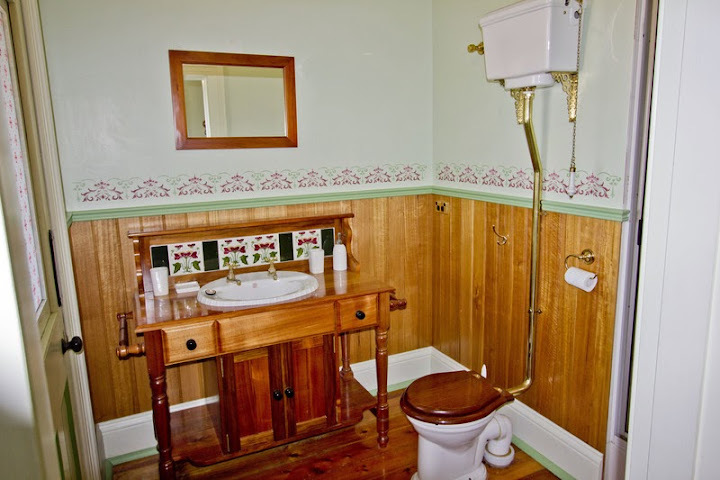 The main bedroom ensuite is authentic federation style. 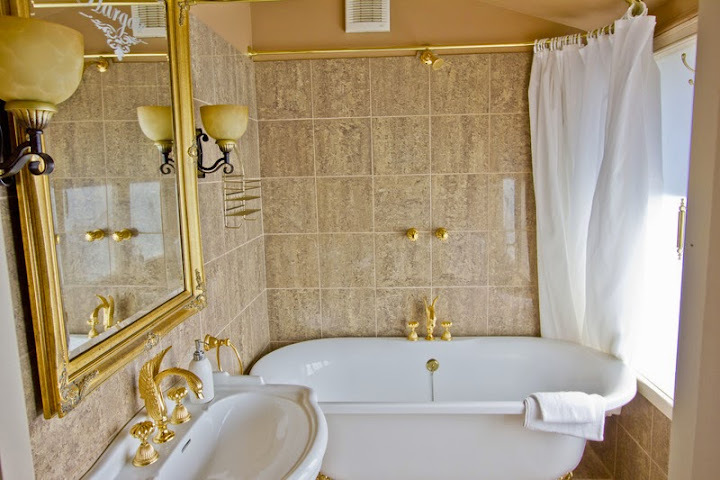 Two identical award winning bathrooms with 24 carat gold neo classical tap ware and full size claw foot baths. 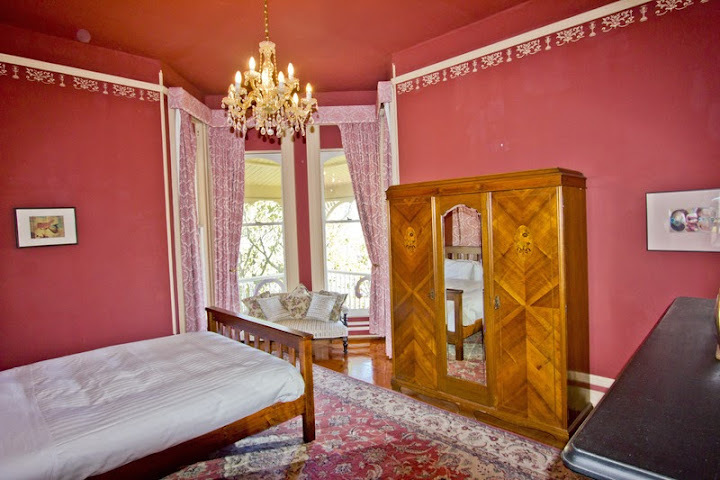 Five downstairs rooms comprised of a highly ornate drawing room, magnificent large formal lounge, formal dining room, full size study, self contained laundry. Ornate fire places in every room except study and kitchen. Italian marble fire places in the drawing room and lounge and ornate cedar mantle in dining room. The enormous eat in kitchen boasts Tasmanian myrtle cabinetry and walk in pantry. Modern features include gas cook top, electric oven and dishwasher. French doors and windows providing beautiful view over significant and private rear garden. Highly efficient hydronic heating is installed throughout the entire lower level. Wool batt insulated ceilings on the upper level. 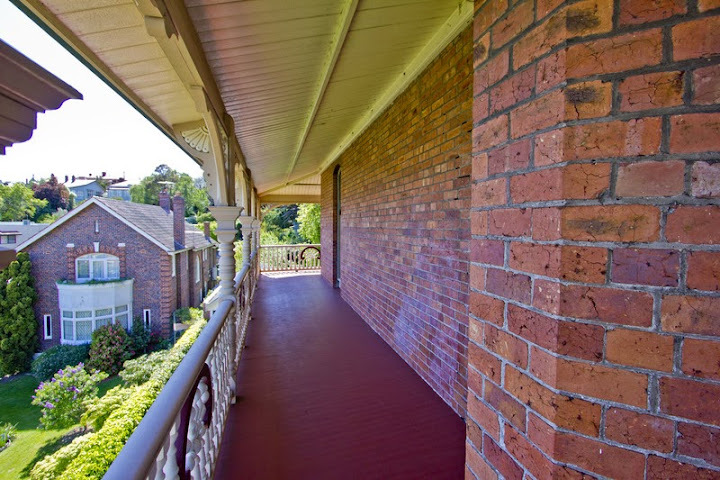 Direct access is available to upper verandah from all but the fourth bedroom. Polished Baltic pine floors on upper level and polished Tasmanian Oak floors on the lower. On site lock up garaging for 3 full size cars and a workshop” which is a rarity given the central location.